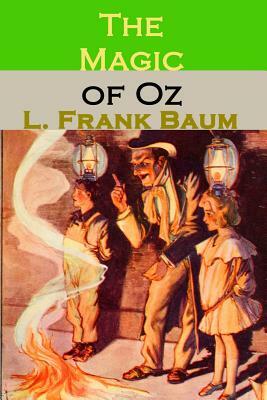 The great L. Frank Baum's last eternal work before he joined the high place. At the top of Mount Munch, lives a group of people known as the Hyups. One of their numbers, a Munchkin named Bini Aru, discovered a method of transforming people and objects by merely saying the word "Pyrzqxgl". After Princess Ozma decreed that no one could practice magic in Oz except for Glinda the Good Witch and the Wizard of Oz, Bini wrote down the directions for pronouncing "Pyrzqxgl" and hid them in his magical laboratory and...where it was eventually discovered by his son Kiki Aru. Yearning for adventure, the boy changes himself into a hawk and flies beyond the edges of Oz. In Ev, he learns that he needs money for food and lodging at an inn (unlike Oz, here money is used). He becomes a magpie and steals a gold coin. When he is human again, a sparrow confronts him over his theft; Kiki says that he didn't know evil before, but is glad he does now. This conversation is overheard by Ruggedo, the Nome who was exiled to the Earth's surface in Tik-Tok of Oz, and he sees through Kiki Aru's power a chance to get revenge on the people of Oz. Dorothy, the Wizard of Oz, the Cowardly Lion, and the Hungry Tiger arrive in the Forest, looking for monkeys to train for Ozma's approaching birthday party. Ruggedo recognizes his old enemies; a terrified Kiki starts transforming people and animals left and right. The Wizard becomes a fox, Dorothy a lamb; the Cowardly Lion is a little Munchkin boy, the Hungry Tiger a rabbit. And Ruggedo is now a goose. Kiki, in Li-Mon-Eag form, escapes with the Wizard's black bag; but the foxy Wizard follows him, spies on him, and learns the correct pronunciation of Pyrzqxgl. The Wizard changes Kiki and Ruggedo into a walnut and a hickory nut, inactivating them; he restores all the transformed beings to their proper shapes. Meanwhile, Trot and Cap'n Bill have travelled to a magic island to obtain a special flower for Ozma's birthday. They have a confrontation with a kalidah, and meet the Lonesome Duck. The island is dangerous: Trot and the Cap'n are magically rooted to the ground, and begin shrinking away to nothing. The Wizard manages to rescue them by turning them into honeybees. Back at the Emerald City, Ozma and her friends celebrate her birthday (though without quite the pomp and fanfare from The Road to Oz) and then decide how to deal with the evil magicians transformed into nuts. The Wizard uses "Pyrzqxgl" to change them back to Kiki Aru and Ruggedo and make them thirsty enough to drink the Water of Oblivion, which will make them forget all that they have ever known. The now-blank slate Kiki Aru and Ruggedo will live in the Emerald City and learn to be good and kind.